You can adjust the quantity you are buying in your Pay Pal shopping cart. Shipping and handling is $3 on all orders. All plants are shipped using priority mail with delivery confirmation. Plants are no longer shipped in the months of January, February and into March. All plants are shipped Bare-root. Yes - small container size plant. This variety will occupy a small flower pot comfortably and remain a manageable sized house plant. Yes - tolerates low light levels. This variety will do well as a houseplant in locations with short periods of direct sun and some indirect or filtered light. Yes - does well with cool winter time temperatures. This variety will tolerate temperatures down below 50 °F. if the roots are kept dry, and will do very well in a home with energy saving thermostat setting. Yes - easy care root system. This variety stores water in the parts of the plant which are above the soil leaving the root system small enough to fit into a proportionally sized flower pot. Yes - flowers easily as a house plant. This variety is likely to flower as a house plant, but results will depend on a variety of growing conditions. Potential living space locations include; East, West or South windows and three to four season rooms with partial shade are best. This species will tolerate very cool days and cold nights, but will need the temperatures to remain above 40 °F. If this variety is to be set outdoors during the growing season it needs to be in a location with filtered sun or some mid day shade, and will tolerate lots of rain. Gymnocalycium horstii usually remains a single stem plant until it is older, and begins producing offsets to become a small pile of cactus globes. These plants can grow to 6 inches wide and 6 inches tall and continues to become a larger plant by making offsets. 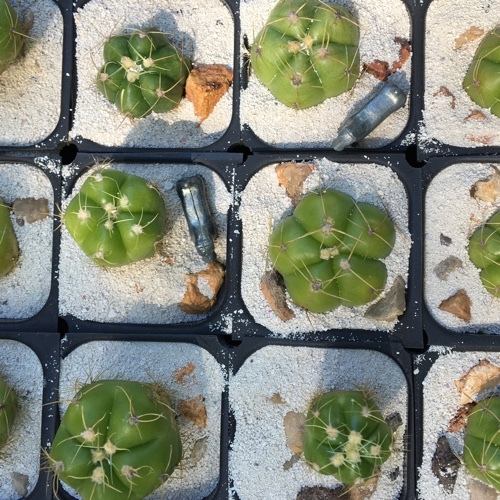 Plants are propagated from seeds by windowsillcactus.com. Purchase price includes a bare-root Gymnocalycium horstii plant. You are invited to also visit Ann's Gemstone Creations: Elegant Sterling Silver and Semi-Precious Stone Necklaces, Bracelets and Earrings.